Home / Updates / Read up on the MR340 race! Read up on the MR340 race! Since 2007, Missouri River Relief has been a partner in the MR340 race - a 340 mile paddling race across the state of Missouri. Racers purchase super cool race stickers and all of that money goes to support our efforts. We bring as many safety boat crews as we can and help up and down the race course. 2018 Missouri American Water MR340 - Somefolks waited, some paddled into the heavy fog on day 4 at New Haven. photo copyright by Steve Schnarr. The Missouri American Water MR340 is a true community event - a community created by the river. To witness the determination of the racers, the grit of the ground crews and the hospitality of the volunteers is a truly inspiring thing. We're proud to be part of this amazing event that has changed the way our state looks at our river. Especially thanks to the Rivermiles crew for putting on such an amazing event and Missouri American Water for sponsoring the race. Below is an archive of articles and info about the race going back several years. Enjoy! MR340 Race Forum - A community forum powered by and for racers. For some select racing archives from the forum, check out this Midwest Paddle Racing archive. MR340 Facebook Group - So Many Good Photos and Stories!!! RaceOwl Race Map, with automated tracking for many of the racers. The 13th Annual Missouri American Water MR340 was quite possibly the smoothest yet. With relatively high, swift water, cool temps and only one fairly mild storm, the conditions were perfect for records to drop. And boy did the records drop. With the lowest DNF ratio ever (about 10%), this was a race built for competition and for personal conquest. Salem News - "MR340: ‘This ain’t no mama’s boy float trip’" - by Donald Dodd, July 10, 2018 - about racer Jess Baldwin. 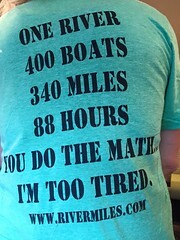 Columbia Tribune - "Boaters in 340-mile race take a break in Columbia" - by Roger McKinney - July 25, 2018. Iosco County News-Herald - "Oscoda man helps set record in Missouri canoe endurance race" - by Jason Ogden - August 7, 2018 - about record breakers "River Fitness"
Grand Forks Herald - "West Fargo couple takes on 340-mile Missouri River kayak race" - by Robin Huebner - August 1, 2018 - about mixed tandem Craig and Sarah Griesbach. 2017 was perhaps the best weather ever for the MR340. Relatively cool and often cloudy with no severe storms. Storms just a few days before the race put organizers on pins and needles waiting to see how the river would react. But it turned out to be a fairly low and slow river for most of the race course. 373 boats started the race with 79 not finishing. A collection of articles, videos and other links from the 2017 race. Columbia Missourian - Three articles and photo galleries focused on Columbia area paddlers Team "Can't Stop, Won't Stop" by Gina Balstad - "Columbia team takes on MR340 for first time" - "Family and friends provide motivation, support for paddlers in MR340 race" - "Columbia team finishes MR340 within time limit"
VIDEO - "MR340 2017 "Team Green Eggs and Ham" - by the Turleys, who ended up not starting the race but helped at race checkpoints all week long. VIDEO - "The People of the MR340"- video by Anna Walters. VIDEO - Posted on the "Two Board Dudes" blog about the 5 person SUP team. "Endings with new beginnings, The MR340 Part 1" • "And we are off, The MR340 Part 2 – Kaw Point to Klondike" • "Klondike to Finish Line – MR 340 Part 3"
This year was the biggest yet and no cancellations or flood threat! 550 paddlers in 370 boats started the race and 391 paddlers in 262 boats finished. Towards the end of the first day was a quick but intense storm that knocked a bunch of people out of their boats. By helping each other, most racers got back in the race and heading downstream before sunset. This was the first year that an all female boat was the first to hit the finish line (in fact first time a female was in the overall winning boat). The six woman boat "Boatylicious" took the honors with a time of 38:22. The youngest 340 racer ever, 11 year-old Konner Norman was in a tandem with his dad, Matt. The oldest 340 participant ever, 81 year-old Dale Sanders "The Greybeard Adventurer", was part of a 3-man SUP team with Shane Perrin and Jerico LeFort. This was the largest SUP field yet, with 17 starting the race and 13 finishing. St. Louis Post-Dispatch - "All-women team paddles 340 miles in 38 hours to win Missouri River race" by Kristen Taketa, July 20, 2016 • "
SUP Racer News - "Inspirational: Bart De Zwart, Joanne Hamilton-Vale and 14 Other Bold Paddlers Conquer the 547km “MR340” Race in Missouri"
SUP the Mag - "81 Year Old Completes MR340 Race on Three-Man SUP" - by Phil White, July 30, 2016. "Paddlers pushing limits in endurance racers" - by Phil White - SUP the Mag - June 30, 2016 - mentions veteran SUP paddler Shane Perrin and his four-man, four generation SUP team "Keep Standing" featuring Dale Sanders (record for oldest man to paddle entire Mississippi River Source to Sea), Jerico Lefort and Nathan Woods. "Alton man kayaking for a cause" - by Scott Cousins, July 16, 2016 - Alton Telegraph. About Logan Sims. "Training For the MR340 Race" by Dave Haessig about his team "Paraquad Wellness Center" with Joan Twillman and Jan Cook. "Garmin Prepares for the MR340" - sponsored post. "2016 MR340: Finding a New Family on the River - Part 1" • Part 2 • Part 3 - Three part blog by veteran SUPer Shane Perrin from Team Greystroked. 2015, the 10th Annual Missouri River 340, will be known for it's high water, extremely hot first day and "The Storm". Even up to the last hours before the race, a series of thunderstorms rolling across northwestern Missouri pushed river projections for the race very close to flood stage, which would force organizers to close the race course. That never happened and the race went as planned. This was the largest run ever, with two dramatic starts - first all solos, then tandems and teams. The first day was brutally hot, with many participants quitting the race at one of the first few checkpoints. On the evening of the first night, a storm rolled through Miami to Glasgow. With such high water, racers were forced to find little spots on the muddy banks to hunker down and wait through the storm, which lasted for several hours in some places. One group hunkered down under a riverside cabin and others waited in boat ramp privies for the storm to calm down. The race leaders largely missed the storm, and this is reflected in the large number of records that fell this race. The Sedalia Observer - "Sedalian to compete in annual river race" - by Randy Kirby, July 22, 2015. About racer Barry Brock. Morning Ag Clips - "Conquering the Mighty Mo" about the "AgRowers"
News Gazette - "Tough Flow to Row" - by Jodi Heckel, August 11, 2015. About Steven Butler and Nathan Willard. Richmond News - "Neither wind, rain nor debris kept Sanson from his goals" - by racer Gary Sanson. Lebanon Daily News - "Paddle power: Looking for a racing adventure, J.D. Moore found a three-day rush by kayak down the Missouri River"
Stunning compilation of aerial video by Columbia artist Paul Jackson - "MR340 - Floating Dreams"
"And they're off" - video of race start by Shane Keyser, Kansas City Star. KSHB-TV - "Missouri American Water River Race begins at Kaw Point Park"
"Blake Thornton: No 1 Stand Up Paddler - Darkhorse mathematician sets record in 340-mile river race" - video and article by Washington University. "We Have Rivers" - a poem by Mitch Story, ground crew for Matthew Story. "Boat 0467: The best days of my life that led to the best days of my life" - by Bob Hines. The 2014 Missouri American Water MR340 was postponed from July to August 12-15 due to flooding in the western half of the race course. It was impossible for many who had registered for the original date to make the reschedule, but still 230 boats with 344 paddlers showed up at Kaw Point Park for the 9th annual MR340. Temps were mild, even a bit chilly at night, with fog in the early morning hours. River levels were perfect and the Persied meteor showers peppered the night sky with gorgeous streaks. As always, the determination of the racers was inspiring and the hard work and dedication of the race volunteers was impressive. For some, this was the perfect race conditions. 190 boats finished. This was also the inaugural run for the e-340, the first all-solar-powered boat race on the Missouri River. Five boats entered, two boats started and one boat finished under its own power at Katfish Katy's. KCUR Radio - "Living to tell the tale - Missouri River Racers Make it Home" - Interview with Doug Jennings and Amy Sevcik on "Central Standard"
Gangsta translation of KC Star article -"Missouri Riva racerz start they 340-mile tour from KCK"
Photos from Hermann Checkpoint posted by "This is Hermann"
Photo Gallery of Race Start by "Mingle KC"
Greg Kolodziejzyk's pedal drive blog "Adventures of Greg"
Team Kruger did the race on the originally scheduled date, flood or no flood! Here's their blog, chock full of photos. This year was one of the most pleasant races in recent memory, with milder summer temperatures. Lower flows made for a slower race in general, but records were still broken. Video slideshows by Judith Bailey • "Those Who Paddled the MR340" • "Just Terry from the start to finish" • "What did they say at the MR340" • "MR340 From the River"
Shane Perrin video shorts • "Checkpoint 1" • "Checkpoint 2" • "Night Checkin" • "Dodging Barges" • "Making Camp" • "Sunrise on the Missouri" • "Prepping for Night Travel" • "180 miles in" • "2013 MR340 Finish Line"
This is from 2011, but it's awesome! Documentary about Shane Perrin's record breaking SUP race - "Stand Up Guy"
Post by South Dakota paddler Patrick Wellner in his blog "Pirates of the Missouri"
This year was dominated by the heat. 3-digit temps on several days. 580 paddlers signed up for the race. About 475 started it and approximately 300 finished. Those that finished used all kinds of innovative tricks to keep cool, from jumping into the river at checkpoints to wearing tube socks full of ice around their necks. You'll see as you read the stories below. Below are a bunch of links to stories, photos and results from the race. Enjoy! "Stand Up Guy" Trailer - footage from 2011 MR340 of standup paddler Shane Perrin. 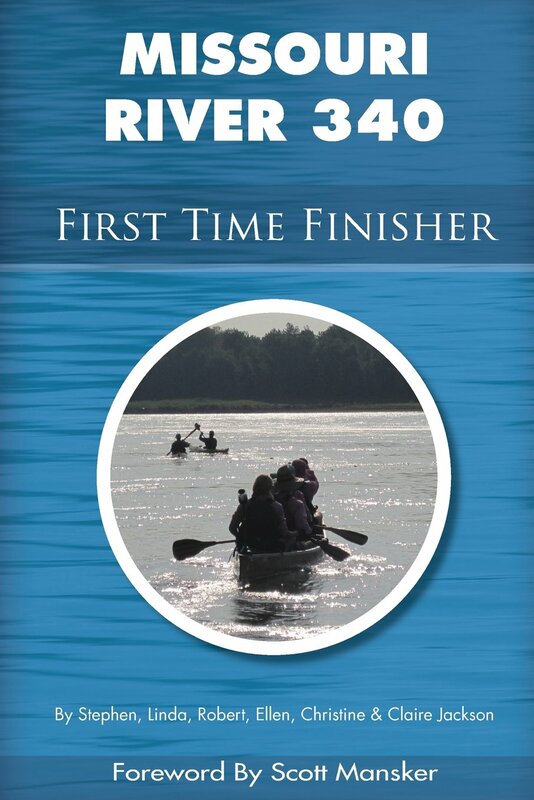 MRR volunteer and veteran MR340 paddler Steve Jackson put together this comprehensive guide to finishing the Missouri American Water MR340. You can purchase it in paperback or Kindle versions. All proceeds benefit Missouri River Relief! Thanks to a generous donation from filmmaker Jodi Pfefferkorn and MR340 Race Organizer Scott Mansker, you can purchase several of their MR340 documentaries as well as their six episode PBS series "Rivermiles" with all proceeds benefiting Missouri River Relief. Click here to order your copy. Register for the Race to the Dome! September 29, 2018, will be the ninth annual Race to the Dome - a benefit race on the Missouri River with all proceeds going to Missouri River Relief. 26.6 miles from Providence (Perche Creek) to Jefferson City. Both races end at beautiful Wilson Serenity Point across the river from the state capital! Check it out and register here.